We left off with a killer Achla Yom, where our beloved Leviim chanichim were enjoying Kerem Carnival! After our delicious barbeque, we were entertained by Wacky Chad’s (a past camp performer) friend Amazing Bob. He wowed us with his ability to juggle knives, while on a triple unicycle, and balancing on five cylinders. 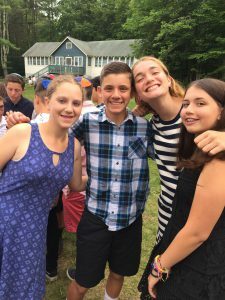 Needless to say all the chanichim (campers) were immensely impressed and highly entertained! Friday we started the day with an iyun tefillah, to start to get the kids in the mood for our first Shabbat of second session! We continued with a typical morning and then enjoyed a lunch of fishwiches. In the afternoon we had our last day of the first set of Sadnaot. Overall, the chanichim have been really enjoying Sadna and some even stated that they are going to continue pursuing these activities during the year. After Sadna the boys played an intense game of soccer and the girls a rousing game of tennis-baseball. 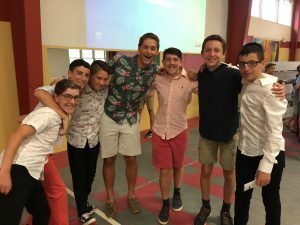 Shabbat was filled of ruach and great food! 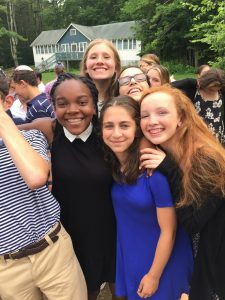 We started with ReleSh (Ruach Lifnei Shabbat), where we sang our hearts out and then happily sat in Gilboa in the warm weather for Kabbalat Shabbat. Saturday was filled with prayer and free time, many of the chanichim split off and played games or read. Sunday half of the banot went to Camp Young Judea and Tevya for the Basketball and Tennis tournaments. The basketball team is being coached by our very own Gabi Cantor. We’re all looking forward to more great weather and an exciting erev casino!